But like their powder foundation, the Bare Skin Foundation is free of quite a few problematic ingredients like parabens, fragrance and oil that can be especially troublesome for sensitive skin. It's also oil-free, so if you've got oily or acne-prone skin, it should be a pretty good fit. The foundation boasts some interesting ingredients too -- according to bareMinerals, its base is actually coconut-derived and it has jojoba-coated mineral pigments. It also has a non-chemical broad spectrum sunscreen with SPF 20, so it offers sun protection too. 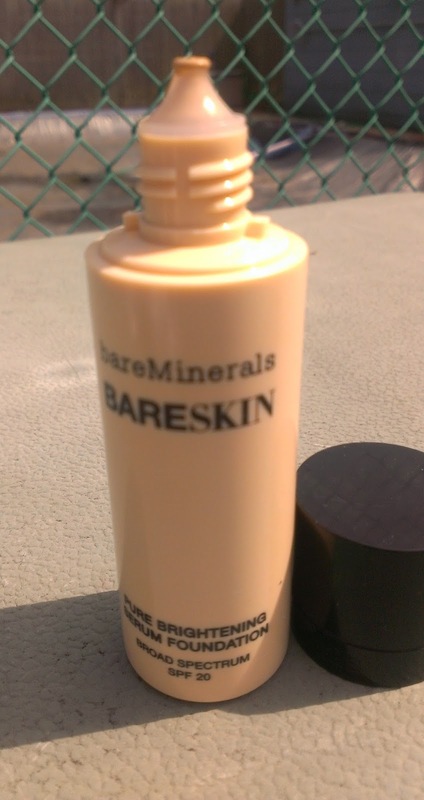 But what really makes the Bare Skin Foundation stand out is its texture and finish. It is extremely thin and lightweight so it doesn't feel at all heavy on the skin. 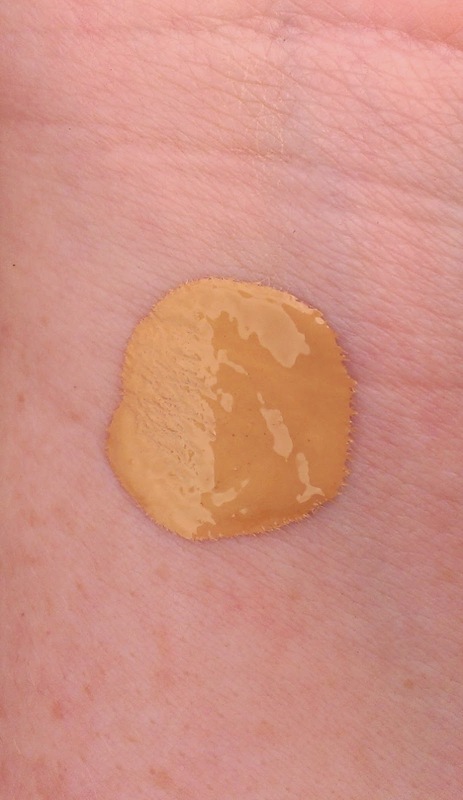 It also looks like actual skin when you apply it -- the finish is satin-y, leaning a little toward the dewy end of the spectrum (so oily-skinned folks may want to get a sample to try out before buying). The coverage is surprisingly good for such a light foundation. I would call it medium, though its thin texture makes it pretty buildable. bareMinerals recommends applying just one to two drops of the foundation to start with, but I found that three to four gave me the coverage I wanted. Bare Skin comes in a squeeze bottle (1 fl. oz) with a small nozzle that makes it easy to control how many drops of the foundation you get. You do have to shake the bottle before each use -- probably because the thin consistency makes it easy for the foundation to separate. I purchased the foundation from QVC a month or so back, where it was exclusive until today. While the foundation is $29 by itself, QVC is offering it right now at a featured price of $43.96 (plus s/h) along with the Perfecting Face Brush that is designed specifically for the foundation and costs $28 on its own. 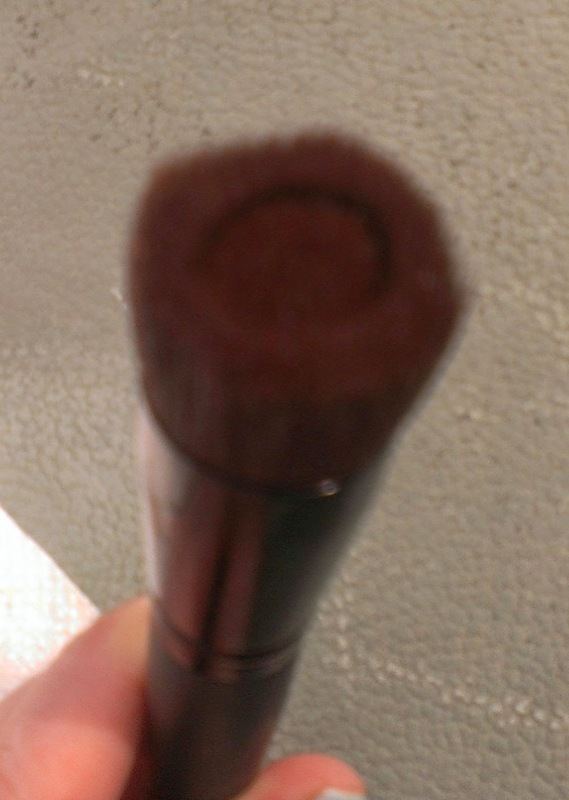 It is a flat top synthetic brush with a small well in the center where you drop the foundation. It works very well to apply the foundation, but I've found that all of my fluffier or flat top foundation brushes work equally well with the Bare Skin so I don't think you necessarily need the brush. QVC also has a limited range of shades -- they offer 12, while there are actually 20 shades available at the bareMinerals website, Sephora, Ulta, and other bareMinerals retailers. The lightest shade, Bare Porcelain 01, would have been my first choice, obviously, but since QVC didn't offer it, I went with Bare Linen 03 -- which is too dark for me. I'm going to pass it on to my mother and just placed an order from Ulta (one last holiday giftcard left to use!) for the lightest shade. But even though I bought the wrong shade, I absolutely love this foundation. I wore it for a few days even though I had to take the time to use bronzer on my neck and chest to make it all blend in because I love the finish and feel of it so much. Of all the light, skin-like foundations I've tried over the past year or so -- like the Revlon Nearly Naked, Urban Decay Naked Skin, and even the Giorgio Armani Maestro -- the Bare Skin is definitely my favorite. If you have super oily or super dry skin, though, it might not be the best option. -- though if you prepped your skin well, it could probably work. I'd recommend getting a sample so you can see how your skin likes it before purchasing it. I highly recommend it for almost all other skin types, though. And the range of shades is pretty impressive so there should be a color match for most people. 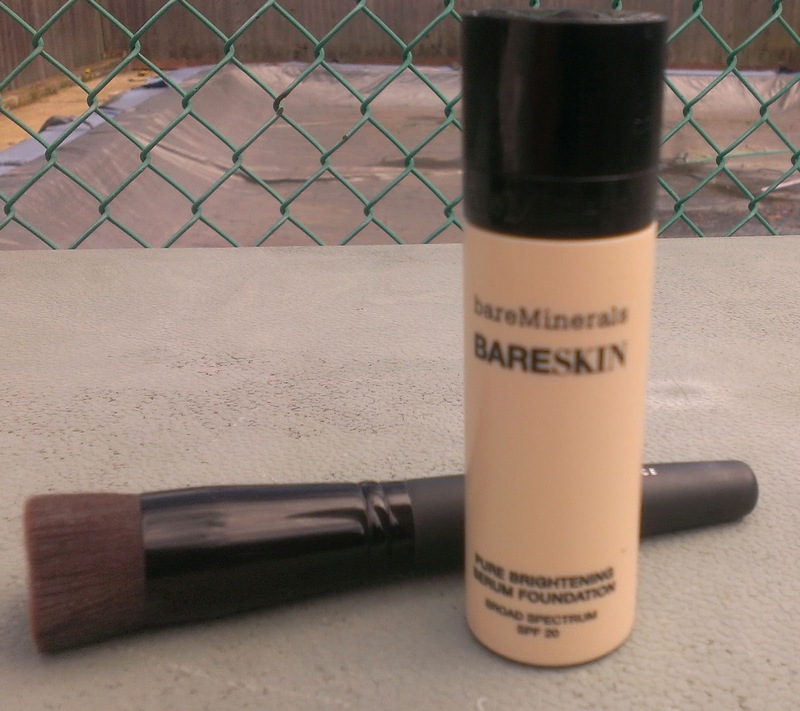 Have you tried the bareMinerals Bare Skin Pure Brightening Serum Foundation? Are you a fan? I'm waiting for Sephora to carry it so that I can get a sample and try it out at home. I am normally a "light neutral" but when I tried on Linen, it was dark, so I also opted for the lighter one. I have noted that the foundation is very thin. I only applied it to the back of my hand, but need to see it on the face! i have tried it, and am on the fence. I think it looks great when I apply it, and love the feel. but later in the day I feel like it shows my pores more, and my husband said it looks like I'm wearing makeup, and I don't normally look that way to him. odd that I think it looks natural, but he doesn't??? gonna give it another chance this weekend, and really decide whether I'm keeping or returning. I haven't noticed that happening with me and God knows my pores pretty darn big. My skin is dry these days, so I wonder if that's the difference? I passed my bottle in the wrong shade on to my mom and haven't received my proper shade in the mail yet, but I'll make a point to see if it settles in my pores by the end of the day.